Walking into the centre that first time the very first thing I see is a familiar tableau of my faith: Mother and Child, seated, the sweep of the lines of the mother's body sculpting a circle of security and warmth around the gentle wrigglings of her baby. Except that this is no Christian Madonna. Dressed in traditional attire, she is a young Muslim woman, perhaps in her early 30s, quiet, gentle and shy. Seated on her lap is a little child who has my heart the minute I lock eyes with her. Her head is framed by a halo of jet-black hair that fans out chaotically in all directions. She has a permanent look of sleepy surprise, at having woken in such a strange world. Occasionally, and not nearly often enough, a lopsided smile breaks through her incredulity. It has since become something of a weekly mission of mine to tease that smile into more regular existence. I guess I feel that if that is still possible, in this place, then there is still hope. For all of them. For all of us. Dancing around our Mother and Child is a skinny, black-haired seven-year-old girl with the same lopsided smile, and with far, far too much energy for the space permitted her. She is so full of life and joy that it beggars belief that this place is able to contain her. It certainly tries. If she was shy, withdrawn, fearful, that would be okay. That would be expected. But she is none of those things. Not now, at least. That she dances around the visitor centre with the unselfconscious ease that my own children, your children, would the family living room is what brings me completely undone. Because this is not a family living room, this is no place for a child, not for this child, or for any of the 16 or so others currently imprisoned there. This is my 'initiation' to the visitor centre at Melbourne Immigration Transit Accommodation, MITA. Don't let the name fool you. From what I can see, there's not a lot of 'transitting' getting done there. And it is all too clear from the industrial size steel gates around the perimeter, the layers of security personnel and procedures, the self-locking doors that slam shut behind you and the constant surveillance, that this is a prison. We have allowed successive governments to let this place become 'home' for some of the most vulnerable children and adults you are ever likely to encounter. That my seven-year-old friend accepts this as her 'normality' is a crime against her childhood, and an affront to any notion of human decency. And it's not just the children. There are beautiful, young, intelligent, articulate, creative people who we are slowly wearing down — too many we have already worn down — to such a point of hopelessness and despair that conversations become dangerously peppered with thoughts of death and dying. There are parents, desperately concerned for the wellbeing and future of their children, who should be free to begin rebuilding a sense of security and safety for their fragile families. There are older people who have been through and witnessed so much horror in their lives, and yet despite all that, long only for freedom, and a chance to make their contribution to community life. And those children, and the babies, with a few more on the way. We have locked them all up, indefinitely, and we are stealing their hope, in an ongoing act of profound inhumanity. It is incredibly distressing to see first hand the harm we are doing to the fragile hearts and minds of these people — many of whom have become friends. I come home most weeks and cry. Some well-meaning people close to me have asked why I continue to go. That's easy. Because as miserable a place as MITA is and despite our appalling treatment of them, these people we treat worse than criminals are in fact the most incredibly warm, funny, courageous, passionate, peaceful, gentle, humble, hospitable people you could hope to meet. Hospitable, you might ask? In that place? Oh yes! You'd be amazed at the ingenuity, and dignity, that can produce a café-worthy cappuccino out of a tin of International roast for a guest. Oh, how I hope I get to experience what some of them might manage with a fully functional kitchen! How I hope — and pray — our Australian community recovers the good sense and decency to take the opportunity to be enriched by the contribution of this inspiring group of people who have so very much to offer us. Rev Lisa Stewart is a Uniting Church minister and regular visitor at MITA. Recent articles by Lisa Stewart. So true - 'stealing their hope' is the worst of the crimes our govt commits against these people. They win public 'approval' because we are not able to know the victims as fellow humans, so thank you for challenging that. One point however; Mary was a Jew, not a Christian. Shame on you Mr Shorten & on you Mr Turnbull. You shame our country. What a beautiful evocative piece Lisa. You have captured so well the roller coaster emotions one experiences when visiting an immigration detention centre. they - and we - are only asking that they live in the community while their claims for protection are assessed. How can we get these families out for Christmas? Thank you Lisa. It would be wonderful to have this article in a daily paper for more people to read and perhaps do something. We are past the point when anyone claiming to be a significant religious leader in this country (bishops, for example) should be leading actions of civil disobedience. Politicians worry about votes. Bishops are anointed to proclaim the gospel and to lead and challenge and teach. Imagine all of Australia's bishops and archbishops risking jail as they stand at the gates of these prisons and demand that the captives be freed! Moral and spiritual leadership is the only way forward. The celebration of the birth of the refugee babe of Bethlehem would be a good time to exercise it ! On the weekend I read that nuns were no longer able to take children out of MITA for recreation visits. What is happening appears to be unspeakable. What can we do? Petitions do not seem to be enough. Many, many people must feel as desperate as I do - and the Rev Lisa Stewart expresses that despair we feel so well. Thank you for a beautiful article, Lisa. And thank you for the kindness you show to the people in the Immigration Prison. I am appalled at what the Australia of my youth has come to when what you so justly call 'an ongoing act of profound inhumanity' can be brushed aside as of no concern by so many of our people, our popularist politicians especially. You are an inspiration. Thank you, Lisa. You have reminded me that beneath all the bluster and grandstanding of stopping the boats and temporary detention lies the eternal truth we are all brothers and sisters in our common humanity. What terrible consequences have followed since politicians have listened to the barking of the dogs in the manger who refuse to share our bounty with the destitute, the displaced and the desperate who come seeking refuge. The pope and the gospels also ask us to respect the sovereignty of nations. This is a hard thing to balance and we must remember that many of those crossing european borders are well dressed young men who are not refugees but rather economic migrants. Australia is a very hospitable country but we, too, have rights which must be respected. There are many people in our own country who are very fragile and sometimes we forget them amongst all the other headlines. Whilst I will not take Lisa to task, i do ask that she offer some solace to those in our own communities who are less fortunate than ourselves. Charity begins at home and then moves out to others. in fact, if parents showed more respect to their own children, we have have an even better society for those who wish to join us from overseas. You have written a wonderful article here Lisa Stewart. Thank you. I would take exception with only one thing you have said: " ... as miserable a place as MITA is .. " Yes, it is miserable beyond words that we [ our elected government ] INDEFINITELY detain people in this manner. Frequently, I hear, " If I'd committed a crime I would be sentenced to a definite period of imprisonment. This 'not knowing' how long is what is so hard to bear." Let us remember that to seek asylum as a refugee is not a crime on anybody's statute books ! I do not find MITA to be a miserable place. I enjoy my Friday visits.I get a 'buzz' from observing all the positive emotional states & human behaviours you list above: warmth, humour, courage, passion, peacefulness, gentleness, humility, hospitality .... I would add, generosity & above all, kindness. How many of these states do we experience in our daily everyday lives? How many of these qualities are present in our elected politicians? Ha ! If I was a praying person, I'd ask that we, here in Australia, let go of our greed, fear, racism & hatred. That's all !! Well said Lisa. 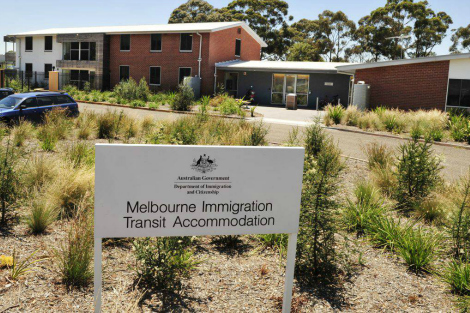 Your insight and descriptions are what I feel when I go to the Brisbane Detention Centre and what I feel about my own frustration when asking for transparent information for my refugee client and husband. who has have signed a consent form for me to ask the Department about their reasons for her being taken back to Detention. I cannot believe that the Department can keep behaving as it does. I wonder in fact if there ought to be a Royal Commission into the methods and practices of the Department. Keep on working at the Lord' work of mercy Lisa, knowing that in the Lord you cannot be labouring in vain Peace and blessings. thank you Lisa for shining a light on the suffering of our friends at MITA. Thank you, Lisa, for your evocative description. I think the hospitality shown by the 'residents' is one of the first things I noticed. If anyone brings in food or snacks, those who receive them offer them to us visitors, as they would with food and drink in their own homes (while we know they are prisoners, they certainly don't like being called detainees, understandably). Thank you, Lisa, for your dedication and persistence in continued, regular pastoral care. From my recent reading, a phrase comes to mind: 'The banality of evil.' And another, pertinent word,'abandonment.' Would you care to enlarge on these?